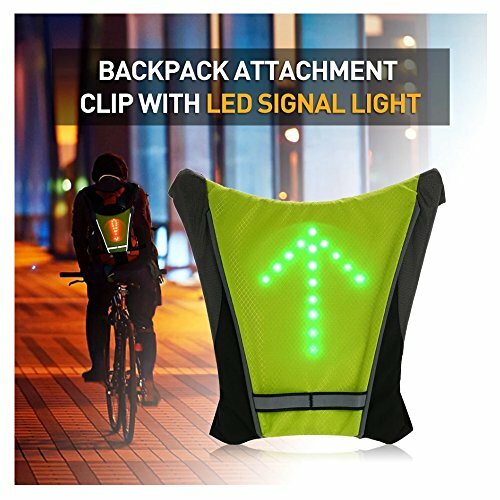 【Direction Indicator Keeps You Safe on the Road】- This reflective LED bike pack accessory is equipped with reflective strips and LED lights. The LED will respond to signal received from remote controller, which will remind passengers and drivers keep distance from you. 【Easily Assembled】- This LED reflective bag accessory can be easily assembled on your own cycling backpack. It`s just a foam panel that attach to a bike backpack. Absolutely a perfect add-on for road cycling. 【Wireless Remote Control】- Wireless control, safely use when riding.Tied or mounted the wireless transmitter on the bike, so you never has to take their hands off the handlebar. It can be used as a wireless bike turn signal light. 【4 LED Signal Available】- It has 4 Led signals: left, right, forward, stop, from turn signals to emergency signals, to reminder drivers for keeping their distance. 【USB Rechargeable Battery】- Recharges from your computer or any device with USB port, no more money wasted on batteries again.